Inspired by all the gorgeous tree blossoms that are now appearing everywhere which to me, herald that Spring is well and truly here; fingers crossed, summer not far away either. Our pear tree is adorned with beautiful white blossom and I hope the wind and rain this weekend, do not effect the wonderful display. Ummm, have written myself a note to go and take a photo "just in case". I covered a piece of hard canvas board with some vintage seed packet images I had bought eons ago (sorry, do not know manufacturer as out of packet). I aged each of the edges with burnt umber pan pastel and then layered them randomly. I then aged the outside edges of the covered board. To soften the colours, I covered the background with white pearl fine medium to create a shimmery/pearlescent effect. Next I inked, then smothered with chromium oxide and green pearlescent pan pastel, 3 pieces of different sized stampbord. I over stamped the stampbord pieces using a selection of images from the Premium Craft brands postcard stamp set. As a finishing touch, I aged the edges of the stampbord pieces with burnt umber pan pastel. You can just about see them peeking through in the photo above. I then framed the stampboard pieces with chipboard tree branches and decorated these with flowers, leaves, stamped images, lace and birds images (taken from seed packet images). From the upper branch I hung another piece of stampbord, coloured with fine white pan pastel medium, mounted a wooden frame and decorated with stamped images/sentiment from the Premium Craft Brands postcard stamp set. It actually swings down which creates an element of movement. It was great actually making a collage inspired piece as do not always use this technique. Being honest it's probably because I shudder at covering lovely bits of papers/images, rather than making them the focal point ... silly I know! Right the sun has popped out so I'm off to first photograph the pear tree and then cut the grass before it turns in to a meadow. WOW! 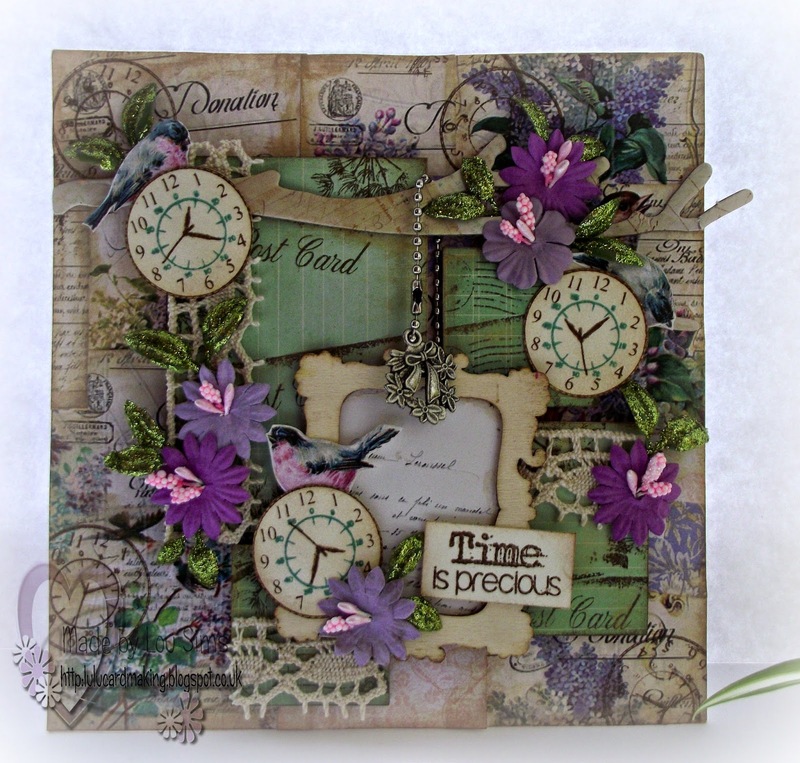 This is stunning Lou, love all the different papers, textures and embellishments. I do agree time sure is very precious. Stunning project with lovely detail and depth. Stunning make Lou, full of delicious details! Lou, it's simply gorgeous whatever you want to call it! I love all the details & the colours you've used! Wowser what a spectacular creation!! Gorgeous collage. Love all the items you are able to put together. This looks stunning! Love the add of wooden embellishment - it fits the theme so well. Pretty die cuts and embellishments. 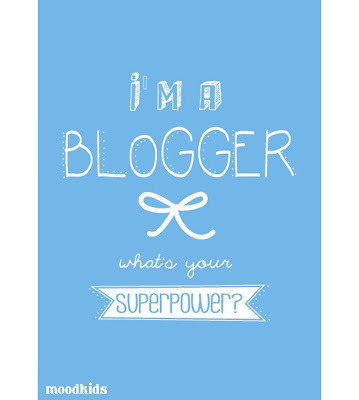 Thank your for playing along with our Things with wings Challenge at Crafty Catz this week. 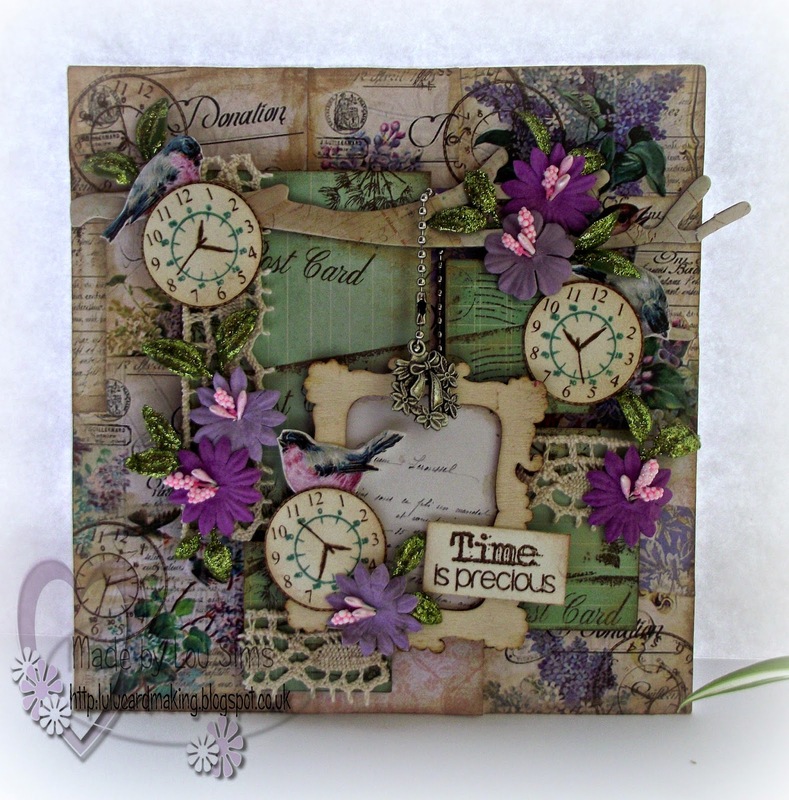 Stunning, Thanks for joining us at Open Minded Crafting Challenges this fortnight for our "Shabby Chic" Challenge. Love the colors of purple and green together, would never have thought of that combo. So many fabulous things to discover in your creation. 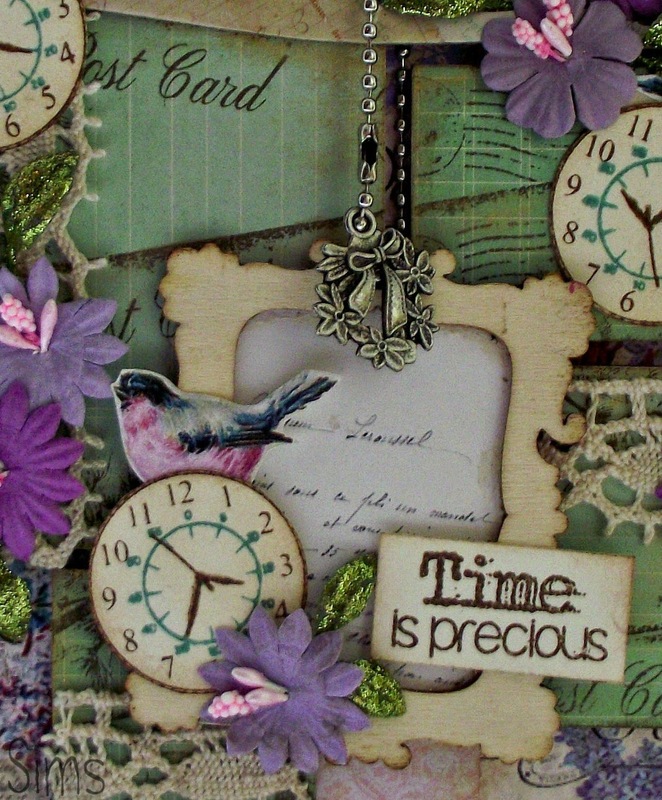 Thanks for sharing on the Open-Minded Crafting Fun Challenge #35 - Shabby Chic. what a gorgeous collage! thanks for playing along at open-minded crafting fun challenges!